Our Dream is to make your dream wedding a reality. 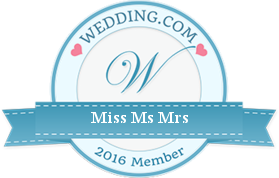 At Miss Ms Mrs we understand the pressure and time consuming coordinating a wedding can be. We are here to be your liaisons for major to minor details. The only worry you will have is how Big to smile for your photographer. No matter what you need us for we can accommodate an Intimate Wedding to a Grand Wedding. ﻿Miss Ms Mrs looks forward to becoming your Unofficial Bridesmaid.